The roof has just been replaced on the historic drinking fountain that had to be rebuilt after a car accident destroyed it. The fountain is at the southeast corner of Library Park. The roof tiles, however, still need to be replaced. 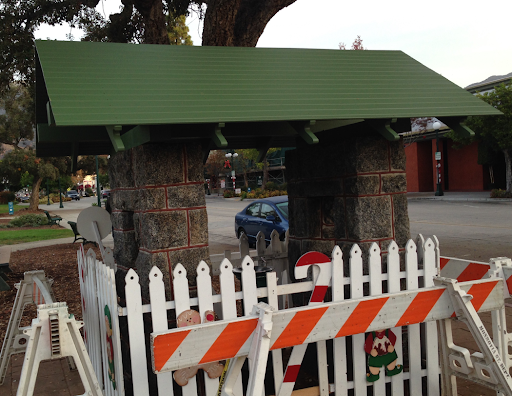 Jim Wigton, of the Monrovia Historic Preservation Group, writes: "The replacement Spanish tiles have not yet been delivered to Public Works (we are getting them from Architectural Detail in Pasadena).. When they are, we will be re-installing them on the roof so that the fountain will look almost exactly the same as before the accident."